DJ Black Light UV Cannon is our strongest UV light and produces a large ultraviolet wash with high output, advanced COB (Chip On Board) UV LEDs–COB LED technology. 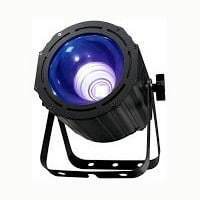 This pro lighting fixture is designed for washing night clubs, performance stages, theatrical productions and special effects events. This unit has 3 operational modes (sound active, manual or DMX), 3 DMX operational modes, 5 selectable dim curves, a 4-Button DMX Display and is flicker free for film and television. The unit is DMX linkable via 3-pin DMX, and is power linkable via PowerCon connections. The light source is an 80-Watt COB cluster of 9×6 (54) 1.8-Watt UV LEDs. Check out our other Dance Party Rentals here. **Notes: this rental requires power, plan accordingly. *All lighting requires installation and may require trusses and/or lighting tripods.